Personality and behavior are not often thought of as heritable, meaning that those traits aren’t usually passed down from parents to offspring. The two are usually thought to be a product of the environment in which an organism lives. Why then are certain organisms able to exhibit certain personality or behavioral traits regardless of their environment? Humans have this ability, depending on the environment most of the time, they adapt to where they are at in order to be most successful. The same could be said for any organism, they are trying too obtain the highest fitness and reproductive rates. Some traits such as levels of aggression, can determine whether an individual survives or is eaten by a predator. If aggressiveness is a positive trait for survival and reproductive success, how is it passed down to future generations? Even though attitude is not necessarily thought of as a gene, it is possible that the combination of many genes and environment an organism lives in can play a factor in behavioral tendencies. Natural selection works in a fascinating way that allows for beneficial alleles, genes and mutations to increase in frequency as time goes on. If it is seen that an allele or trait is beneficial, females will look for males with that particular trait (sexual selection), so that their offspring have a better chance of surviving and reproducing in the future. This extraordinary phenomena can be seen in many different organisms, such as humans, elephants and even fish. One such fish in particular is the three spined stickleback. It has been found in previous studies that boldness and aggressiveness are positively associated when the sticklebacks are being hunted by predators, but the two traits decrease when predation are at low levels (Bell and Sih, 2007). 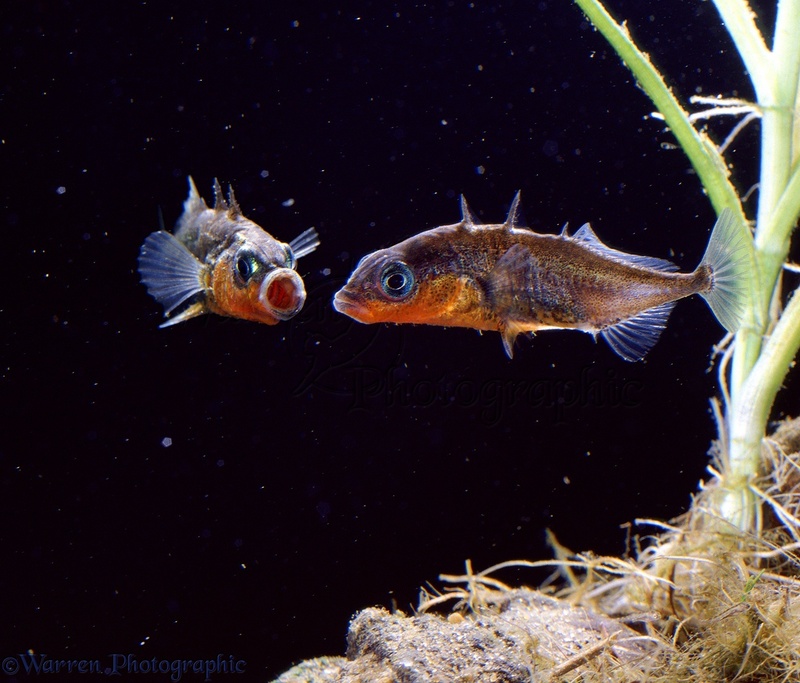 If a stickleback exhibits aggressive and bold behavior during predation then they are more likely to survive than a stickleback who does not exhibit those tendencies while under predation. But shouldn’t all members of the same species have the same behavioral tendencies no matter the environment? To answer this question, a study done by Alison Bell and Andrew Sih (2007) examined sticklebacks from a population that was low in predation and tested whether they could get these sticklebacks to exhibit the aggressive and bold behavior that would help them survive when under predation. To measure aggressiveness they measured the response to a simulated intrusion. The scientist placed another stickleback that was not part of the experiment in the same territory. Then the fish of interest was observed and scored based on how they interacted with the “predator” (Bell and Sih, 2007). At least two hours after the fish of interest had been scored for aggressiveness, they were then scored on how willing they were to roam around with a simulated bird predator nearby, which is how boldness was measured. The study found that sticklebacks scored higher in boldness were less likely to survive. But those that scored higher in aggressiveness were more likely to survive (Bell and Sih, 2007). Since aggressiveness was measured before real predators were present, there is some other factor in more aggressive sticklebacks that aid in survival. The sticklebacks that survived the predation attack were again recorded to see if behavior changed toward the same species of stickleback when placed in the same environment (Bell and Sih, 2007). Levels of aggressiveness decreased once the predator was removed, so this suggest that the sticklebacks can adjust their behavior based on the environment. One possible explanation for this phenomenon, sticklebacks were on such high alert while the predator was present that, when other less frightening organisms appear they are not as worried about predation occurring (Bell and Sih, 2007). The authors suggest that more aggressive sticklebacks are more attentive to the environment and the predator, if supported then that is an interesting hypothesis. In my opinion, based on my observations, when humans are aggressive in an argument, it becomes very hard to focus on the little details of whoever one is arguing with. Of course it is difficult to compare humans and sticklebacks but if what the scientists hypothesize is true, then the sticklebacks have an extraordinary gift. The ability to adapt is very important and if utilized correctly, adaptation to different environments can be the difference between life and death in the case of the three spined stickleback. Different environments can change phenotypes of organisms with the same genotype, a concept known as phenotypic plasticity. (Zimmer and Emlen, 2016). But it appears as if a different type of plasticity appears for sticklebacks as predators are present. Behavioral plasticity, allows the sticklebacks to switch behaviors in different environmental situations, similar to most humans. I have several questions and possible suggestion about the study done by Bell and Sih. What is an accurate way to measure personality or behavioral traits? There are so many potential ways to measure say aggression, how do scientist decide what to score as traits of aggression and what to leave out. Based on Bell and her colleagues methods for behavioral observations, how do we know if their ways were the most efficient ways of scoring aggressiveness and boldness? There might be other ways to simulate the characteristics of the sticklebacks. Can you teach sticklebacks certain personality traits to see whether they are advantageous or not. Some scientists and researchers teach organisms that exhibiting certain traits benefits the organism (Van Praag et al. 2005). Would there be a way to teach the sticklebacks to exhibit a trait, so that we could observe whether other traits besides aggression and boldness lead to an increase in survival rate once predators are present in their environment. I think this would be really useful and if it were found that another trait were advantageous how many generations would it take for the trait to reach close to fixation? The main suggestion I have would be to try and examine other organisms that use aggression in a positive manner and produce a similar experiment and compare the results. Then we can see whether the predation causes behavioral plasticity or if it is just the environment in general. I learned quite a bit from this article. If you would like to know more I suggest that you read articles 1, 3, 4 and 5 listed in the reference section to learn more about behavior plasticity and its impact on organisms. Researchers are actively trying to understand behavior and heritability and I am excited to see what we learn. Aubin‐Horth, N. (2016). Using an integrative approach to investigate the evolution of behaviour.Evolutionary Applications,9(1), 166-180. Bell, A. M., & Sih, A. (2007). Exposure to predation generates personality in threespined sticklebacks (Gasterosteus aculeatus).Ecology Letters,10(9), 828-834. Fehl, K., van der Post, D. J., & Semmann, D. (2011). Co‐evolution of behaviour and social network structure promotes human cooperation.Ecology letters,14(6), 546-551. Van Praag, H., Shubert, T., Zhao, C., & Gage, F. H. (2005). Exercise enhances learning and hippocampal neurogenesis in aged mice.The Journal of Neuroscience,25(38), 8680-8685.
Zimmer, C., & Emlen, D. J. (2016).Evolution: Making sense of life (2nd edition). Roberts and Company Publishers, Inc.